This insider’s account of the USA‘s fight against terrorism from the Reagan administration until after 9/11 makes for gripping reading. Although Clarke apparently got a number of facts wrong, the big picture seems to be portrayed correctly. 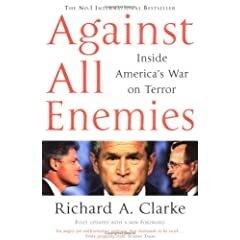 Some parts are heavily disputed, though, like the connection of the 1993 World Trade Center bombing to Iraq, and whether the Clinton and Bush Jr. administration dealt adequately with al Qaeda (search online for Clarke/Mylroie to find details). But then, Clarke paints a positive image of Clinton’s actions, and a negative one of Bush Jr.’s actions, while Mylroie sees it just the other way around -and has her own books to sell- so some disagreement is to be expected. His Pentagon-appointed lawyer stayed silent during the trial, refusing to even answer questions from the judge. Read it at Gitmo jury: Life sentence for bin Laden videomaker and weep.